Although round houses are nothing new — think of Native American teepees and African huts — their design is widely considered futuristic, and is characterized by a strong strain of utopianism. Innovative twentieth century architects such as Frank Lloyd-Wright, John Lautner, and Richard T. Foster were attracted to rounded and curved forms, often attributing transformative qualities to them. Buckminster Fuller’s geodesic dome and round Dymaxion House — “the house of the future” — are the most obvious examples of this tendency, but even some of the lowliest vernacular buildings are touched by it. 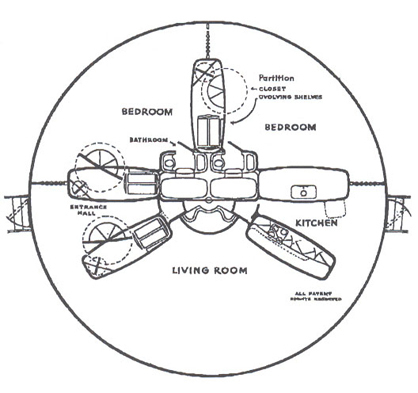 Dymaxion House floor plan, from approximately 1946. By their form, round houses reject the rectangular status quo and challenge default assumptions about structure. They open up new possibilities. They require thought. The true shape of utopia is famously hard to discern. Yet with round houses, at least, one can sense the effort to find it. We made these gray houses that you see, and they are square. It is a bad way to live, for there can be no power in a square. Everything an Indian does is in a circle, and that is because the power of the world always works in circles. The earth is round like a ball, and so are all the stars. 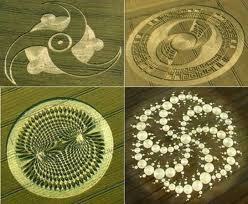 Birds make their nests in circles, for theirs is the same religion as ours. The sun comes forth and goes down again in a circle. The moon does the same, and both are round. Even the seasons form a great circle in their changing, and always come back again to where they were. The life of a person is a circle from childhood to childhood. Our teepees were round like the nests of birds and these were always set in a circle. The White people have put us in these square boxes. Our power is gone and we are dying. Where would I be able to find information on how to start building my own Dymaxian house, or even just modifying a house according to Fuller’s efficiency specifications and such? The Dymaxian house is built completely differently than standard homes with completely different assembly methods and materials, and I don’t even know where to begin to look for how to put any of the ideas to work on an actual house plan. I can find a wealth of information on what the Dymaxian house is, but none on actually constructing one, or even on how to incorporate any of the house’s efficiency aspects. Are there any sources that have information on actually constructing a Dymaxian (or at least significantly Dymaxian-influenced) home? First of all there are no straight lines in nature, nor are there squares, rectangles, or triangles. The only line that could make a form is the curved line which makes a circular form; straight lines don’t make a form. This is why circular or curved lines are important in design. Sorry Livon … that is not a correct comment at all … Crystals (and other aspects of geology) are more than natural, and come in a manner of geometric shapes, from square, rectangle and many others. Many aspects of nature are rectilinear in both design and characteristic. Though round and related organic shapes are interesting and have their uses, they do not lend themselves well to more utilitarian application … something Bucky himself acknowledged later in life.